The imagination of story-teller Angela de Caprariis-Salerno and artistic talent of Harriet Carotenuto combine to create a charming activity book about a little girl named Violet who visits the Hempstead Plains prairie and discovers a whole new fascinating world of knowledge. Full of pages to color, word puzzles to solve, poems to create and stories to read, this book will inspire children from first to sixth grades and beyond. It also tells the story of a true prairie habitat full of natural wonders. Great for school classes, scouts and others interested in learning more about nature. All proceeds from this book are allocated for the restoration and preservation of the Hempstead Plains. $10.00 Schools or organizations interested in multiple copies, contact Friends of Hempstead Plains for group discount. A book detailing the colonization and settlement of villages and historical sites across the Hempstead Plains, from Floral Park to Bethpage. With pictures of historical buildings and landscapes, it tells a story spanning four centuries, including our struggle for independence, immigration, industrialization, technical progress, suburbanization and ethnic and cultural diversity. Island Prairie: Plants and Animals of the Hempstead Plains. Buy it now for $14. Includes Shipping! Order our 2007 Poetry Collection! A compilation of poems from Poetry Workshops at the Hempstead Plains. To pay by mail, see address below. Send a check in the amount of $14.00 (Includes $2 for shipping). 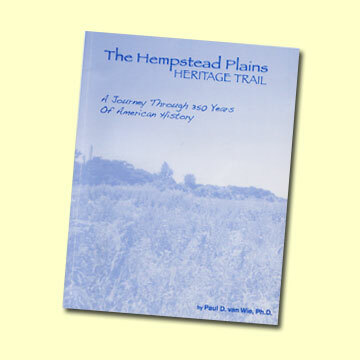 The Hempstead Plains Heritage Trail, a Journey Through 350 Years of American History, by Dr. Paul van Wie, Ph.D.
* Please include the address where you want the book sent.